The presence of a chemical pollutant – like benzene or formaldehyde – exhausted while using building materials like paints or insulating foams. The building’s age. Institutes for hygiene at work and studies of indoor air quality shed light on the negative effects on health induced by formerly used substances. The new high-quality constructions standards related to insulation and tightness that are designed to recycle rather than renew indoor air. Carbon dioxyde (CO2) is naturally present at low concentrations in the air; it is colorless, odorless and heavier than air. This gas directly effects human health with headache, tiredness… While people gather themselves in a poorly ventilated space like an office, a classroom or a small room in a public-access building, the level of carbon dioxide rate in the air will grow. Benzene is the most dangerous indoor air pollutant. Current standards tend to limit its diffusion in buildings open to the public. The International Agency for Research on Cancer (IARC) classifies benzene as a category 1 (R25) carcinogenic agent. When ingested or inhaled, this organic compound is harmful to the breathing tracts – especially for lungs (R65) – and the eyes (R36) as well. Formaldehyde is highly toxic if inhaled. This irritant gas can cause burns (R34). For a long time the International Agency for Research on Cancer (IARC) has been classifying formaldehyde in group 3: non-classifiable for its carcinogenicity. However, after series of studies in 2005, formaldehyde was finally classified as a group 1: proven carcinogenic agent. Perchloroethylene is a very toxic organic vapor that can be present near dry cleaning installations. Classified as a 2A (R40) substance by the CIRC, it can also be irritating to the eyes and breathing tracts, and can cause headaches and dizziness. Indoor air quality analysis consists of measuring and monitoring exposure levels to some harmful gases like carbon dioxide (CO2), benzene, formaldehyde or perchloroethylene. The short- time exposure limits and time weighted average values (STEL and TWA) are set by health and labor official government agencies - like the EPA and OSHA indoor air quality guidelines - and constantly evolve according to new knowledge on these substances. With a very competitive price, the IR7000P is a portable, cost-effective and user-friendly unit designed to detect CO2 concentration and ambient air temperature. The IR7000P portable single-gas detectors using infrared technology has been designed to monitor and measure hazardous concentrations of CO2 (carbon dioxide) and ambient air temperature. 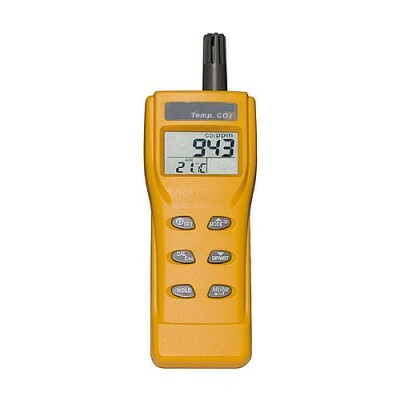 This flexible and cost-effective handheld gas monitor uses a nondispersive infrared advanced technology (NDIR) to get accurate and reliable measurements of CO2 expressed in ppm (part per million) in less than 30 seconds. Its large illuminated screen simultaneously displays both ambient temperature and CO2 concentrations. Values can be displayed as TWA (time-weighted average upon 8 hours) or STEL (short-term exposure limit upon 15 minutes) measurements. Thanks to its RS232 integrated output, the IR7000P CO2 gas detector can simply log data for longer time. This carbon dioxide gas detection device is ideal for monitoring indoor air quality. This way, an adequate ventilation reduces risks related to the presence of CO2 such as temporary sickness, downtime and lost productivity. IR7000P portable single-gas detector appears to be an ideal solution as well to measure carbon dioxide levels in incubators, greenhouses, food industry or any application where correct CO2 rates are essential for the process outcome. Powered with 4 replaceable AA alkaline batteries, the IR7000P personal CO2 detector can continuously operate within 24 hours and can be used in high temperature (from 0 to 50°C) and relative humidity (from 0 to 95% non condensing) conditions. This small and lightweight (approximatively 180 grams without batteries) gas detection equipment features a 80 dB audible alarm to alert user in case of abnormal carbon dioxide concentrations even in noisy environments. Featuring a long-lasting shelf-life of more than 15 years, the infrared gas detection sensor only requires regular calibrations with fresh air, which makes the IR7000P even more easy to use and user-friendly. The detectors furthermore includes an integrated automatic self-diagnostic function. Lastly, its rugged case made of ABS/PC combination is IP30 approved against solid foreign bodies. 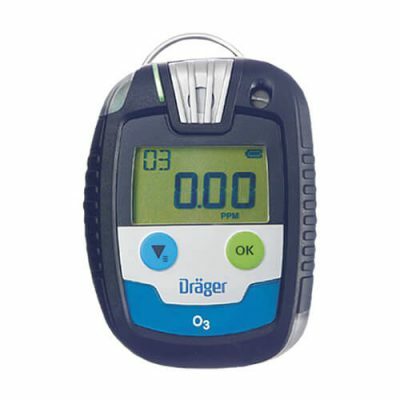 The QUALIT-AIR PRO is a CO2 detector/transmitter. Featuring main controller and an external display, this wall-mounted analyzer is well-suited for monitoring ambient air quality and managing climate control systems. The Qualit-air Pro air quality analyzer has been especially designed for use in hazardous operations like cutting and welding, the food packing industry, the beverage industry, the agriculture and food industry, waste management or thermal treatments. This monitoring device continuously detects presence of carbon dioxide (CO2) in ambiant air on a measuring range set between 0 and 50,000 ppm (part per million). Its remote display unit placed outside the monitored room enables operators to easily and safely read concentrations in presence. 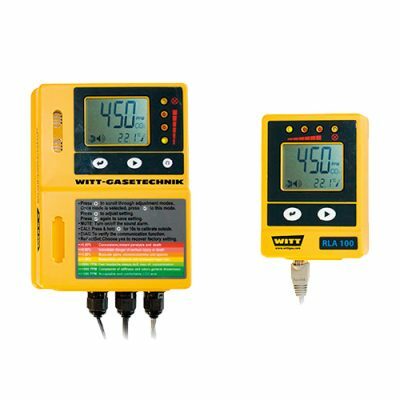 The main controller and the remote display unit enable a digital display of CO2 concentrations in a room and both feature 4 LED visual indicators for a permanent monitoring of gas levels. The operation principle of these two devices is relatively simple to understand. The remote display unit copies and displays controller measures on an LCD as well as relevant safety information. It is linked to the controller with a maximum 8 meters wire and must be placed outside the controller room. The remote display unit must be installed where it can be easily read before entering the controller room. The two alarm thresholds of the Qualit-air Pro can be adjusted in the measuring range. Moreover, the integrated audiovisual alarms enable to alert operators in case of abnormal carbon dioxide concentrations. This detector can also trigger actuators such as initiating a ventilation system. Thanks to its intuitive and user-friendly menu of the Qualit-air Pro, operators can check the connection between the controller and the remote display unit, calibrate the detector, select the temperature unit (°C or °F) and setup the alarm thresholds. Thanks to the easy wall mounting of this fixed CO2 detector and its two plastic made housings both IP54 certified against water spray, the Qualit-air Pro is a relevant cost-effective solution to protect an hazardous area that might contain carbon dioxide. 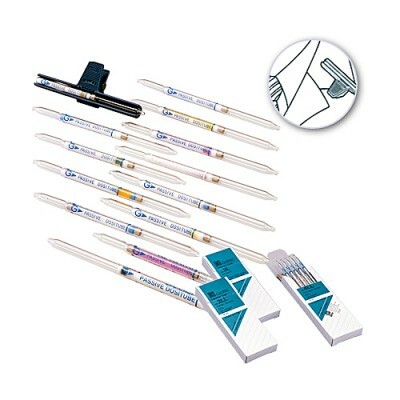 TWA measuring system (time-weighted average) – also known as dosimeter tube or passive tubes gas detection – measures the time-weighted average concentrations of a gas in ambient air. The dosimeter tube is inserted in its holder and wore close to the breathing zone (e.g. a shirt collar) to get an accurate measure of inhaled concentrations. This allows the monitoring of hazardous exposure during a working day. Thanks to this system, wokers can easily get daily exposure concentrations and evaluate working areas. These simple and direct measures require no specific analyzis instruments or complex operation procedures.